Home>News of Machinery and Equipment > Asia’s factories are back in business! Asia’s factories are back in business! Finally after what seemed an eternity, Asia’s manufacturing industry is on the rise (I hope I’m not speaking too soon). 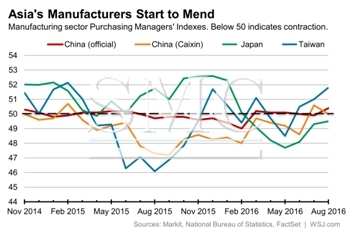 Statistics gathered by (Markit, 2016), (National Bureau of Statistics, 2016) and (FactSet, 2016) have suggested that manufacturing in Japan, Taiwan, China and South Korea is showing signs of progression. In relation to China, the PMI of manufacturing has exceeded the market expectations, increasing from 49.9 to 50.4 in July and August respectively, a period analysts expected to remain unchanged. emerging-market economist in China anticipating that it will provide added strength the Chinese Yuan, the result has also caused Commerzbank to alter its GDP predictions from 6.3% to 6.7%. Similar reactions to the statistics have been seen in both Japan and Taiwan. 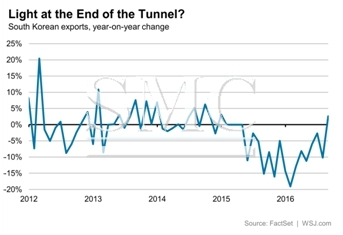 South Korea has suffered more than most this year, with a majority seeing positive first half results in export volumes unlike South Korea, but finally they are also seeing positive statistics. (One of the main economic sources). However, as we are a manufacturing based company in China, it is nice to finally see some positive trends for the industry!